At age twelve I became the keeper of the WWII photography collection of Maj. Raymond J. Getz M.D. Getz served in Gen. Patton’s 3rd US Army in WWII. Getz organized their administration of hospitals for liberated POW’s released from Nazi concentration camps. He also photographed the Holocaust, the concentration camps and his patients (the survivors). Images of totalitarianism have haunted me ever since. To this day I work to understand the motivations fueling and justifying ethnic hatred as well as crimes against humanity. The complete Getz Collection of WWII Photography is found at www.ericringsby.com. As a teenager, I was drawn to live under military dictatorships in Paraguay and Chile as an exchange student. I doubt I would have gone without the Getz influence. Before leaving for South America, I had been interested in joining the military. My first hand experiences of military dictatorship transformed me into an anti-war activist. In 2000 I made a personal pilgrimage to Israel. At the Wailing Wall I read the Old Testament and prayed for three days. The political realties I witnessed appalled me. Not being Jewish or Muslim, but an independent minded 5th generation Coloradoan who lives and works on the old family ranch, I have delved into the political crisis in Israel with the freedom of a complete outsider. The more I’ve investigated, read, witnessed, and compared with my own history, the more a parallel emerged, i.e. the parallel histories of Native American Indians and Palestinian people. I see two native peoples driven off their ancestral land by settlers who justified their quest in the name of God and by their blood spilled by the natives. My unique perspective allows me to identify with the Indian and the pioneer, Palestinian and settler. With art, I work to end a particularly bloody colonial occupation by dealing with its grim reality head on. 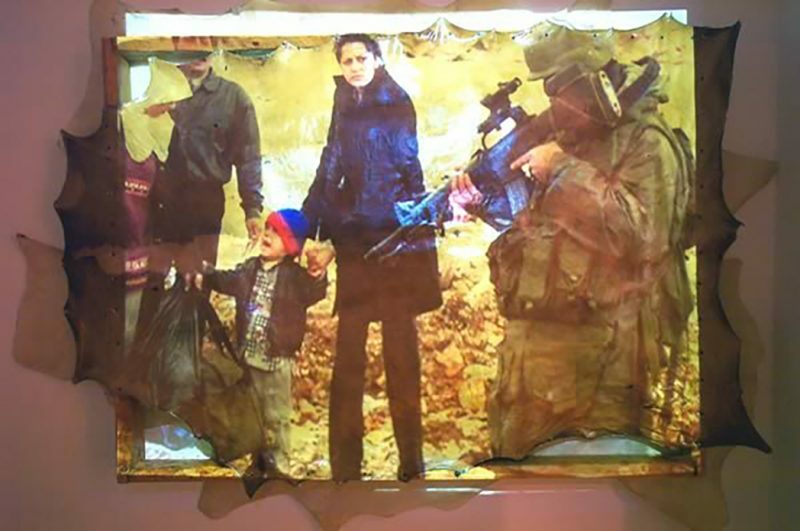 In my collaborative exhibition full rawhide skins have been impregnated with video and photographic images of atrocities committed in the Occupied Territories. The historical allusion is to the buffalo hide painting of the Plains Indians that artistically documented their battles. Neither people had a voice in the media; both watched helplessly as their cultures were leveled. I lament that the world was not moved to act by the plight of the Indians nor of the Palestinians until it was too late. Friends, I made in the process of my investigations, who were moved to act for peace and justice in Palestine helped make this series possible. These peace activists donated photographs and videos to pierce media censorship and show Americans what has been going on from 1948 to today. Perhaps with our combined efforts lasting peace will be achieved.